A new study published in the journal Environmental Health Perspectives digs deep under the sidewalks and streets that are soaking up all this new heat in our cities — and finds that not all neighborhoods and racial groups are faring equally. According to the research, blacks, Asians, and Latinos are all significantly more likely to live in high-risk heat-island conditions than white people. It’s all about trees (or lack thereof). We tend to decarbonize as time goes on (from carbon-intensive wood to coal to petroleum to natural gas). If you haven’t dropped by Wired Science’s new map blog, check it out. Still new, but off to a good start. The California Supreme Court ruled Monday that digital mapping files known as geographic information systems must be released under the state’s public records law. If you want to live a long time, where should you reside, the city or the countryside? There are compelling arguments to be made for both. In the city, you could be the victim of a crime; in the country, an accident of man or nature could claim your life. Regardless of the various marks for and against, overall death rates are neither higher nor lower in the city than in the countryside. But suicide rates are a different story. A couple of years ago, I covered the topic in some detail, drawing on three published studies. I discovered that suicide rates are higher in less populated areas for a couple of reasons. One is access to weapons—there tend to be more of them in the countryside, and they’re an awfully effective way to end a life. But more significant than that is one’s mental state. People with mental disabilities are more likely to take their own lives, and there is less access to mental health resources in less densely populated areas. That’s not all, though. A new working paper published to arXiv.org by a motley crew—two insect ecologists, a systems scientist, and a theoretical physicist—adds a new wrinkle to the conundrum of mortality rates and population density. Like many other researchers, they found no overall link between mortality and population density. But once they limited their sample to young people, they saw rates of suicide and, to a lesser extent, accidental death skyrocket at lower population densities. Accidental deaths are somewhat easy to explain. In low-density areas of developed countries, driving is common, as is driving at high speeds. Accidents at higher speeds are more likely to be deadly, and young, inexperienced drivers are involved in more accidents. More puzzling, though, was what happened at higher densities. Above 777 people per square mile (300 per square kilometer), suicide rates flattened. As a raw number, that’s not very high. A city with a population density that low is hardly a city. But a county or state at or above that number is dense, which is what the researchers used—U.S. counties, Japanese prefectures, French départements, and so on. The sort of places that have those population densities contain some real cities or metro areas—San Diego County in California and Denton County in Texas, which is part of the Dallas-Fort Worth metro area. The reasons for this floor remain illusive. The researchers think social bonds may play a role, citing a “stay alive” effect that biologists see in lab-grown cell populations, where cells that don’t receive constant prods from companions commit suicide. Cities, they say, provide equivalent prods; it’s as though the mere fact of interacting with other people reminds you to stay alive. It’s an intriguing notion, but it’s obviously not a perfect analogy since some people can live for a very long time without constant prodding. Plus, none of the authors of the paper are sociologists or anthropologists—their conclusions are a bit speculative without some support from those fields. Maybe they’re looking for someone in one of those fields to collaborate. Currently, the paper is merely in working form, meaning it hasn’t been peer reviewed. The authors have put it out there so their peers can propose ways to improve it. Regardless, the floor in suicide rates they’ve found is intriguing. There’s bad news and good news in that result. The bad news is that adding social bonds by increasing population density doesn’t seem to affect suicide rates. To have any effect on that, we’ll need more robust social services to catch the people in danger of slipping through the cracks. But the good news is that there doesn’t appear to be a point at which the trend reverses—massive cities do not, it appears, drive us to the brink. All over the countries of the world there is a fear of central government. It’s not unjustified. But when it comes to preparing for climate change, only big government has the resources to act in advance. That’s the dilemma we face. Here’s how thinking about the world works in Silicon Valley: when public transportation is disrupted (in the old sense) due to labor disputes, that’s not an inconvenience! It’s an opportunity to plug your app and offer helicopter rides—literally fly over society’s problems. The kudzu-like spread of private transportation companies in San Francisco has been good for city residents who can afford to use them, and the dot-com founders that have gotten rich by replacing public-sector functions with their own services. But yesterday, when a system-wide BART strike took down the Bay Area’s best form of public transportation, we saw the dark side of Silicon Valley’s obsession with privatizing everything. Namely, it has created a two-tier transportation caste system, where the private-sector solutions flourish, often at the expense of the public infrastructure that a large part of the population still depends on to get to work and go about their lives. The speed at which these enormous projects are popping around in the waters around the U.K. is impressive, especially considering the ongoing difficulties with getting even a single offshore turbine up and running in the U.S. (Cape Wind might have one by next year! Maybe!) There are now around 20 distinct offshore wind farms around the U.K., generating enough power for 2.3 million homes; when all offshore turbines that are spinning, in construction, or planned are combined, they total 15 gigawatts of capacity—about a quarter of the entire U.S. onshore wind power capabilities. Inner-city parking lots could become parks. Traffic lights could be less common because hidden sensors in cars and streets coordinate traffic. And, yes, parking tickets could become a rarity since cars would be smart enough to know where they are not supposed to be. As scientists and car companies forge ahead — many expect self-driving cars to become commonplace in the next decade — researchers, city planners and engineers are contemplating how city spaces could change if our cars start doing the driving for us. There are risks, of course: People might be more open to a longer daily commute, leading to even more urban sprawl. Coastal metropolitan regions have faced up to the fact that there will be increased flooding, volatile weather, and sea level rise. 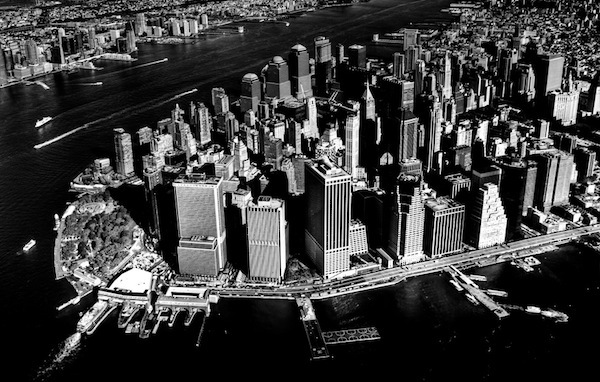 New York Mayor Michael Bloomberg has stepped up with a model $20 billion plan that is a mix of living with water and keeping it out. This is the great planning challenge of our time – and it’s expensive. So private developers should be expected to contribute to the cause. Build on a waterfront? Sure, but a condition of the permit is a contribution to a floodgate fund. With Koontz, lawyers now have a perfect opportunity to say no way, that such a requirement is out of proportion with the modest scope of an individual development. The Koontz family bristled at the idea of restoring wetlands miles from their property. Why should one builder be held accountable for a problem the whole world is responsible for? These are going to be tricky waters to navigate (pun intended and apologized for). Building at the water’s edge is a risk, and building codes have been established to minimize the risk of fire, flood, and so on from harming a building’s inhabitants. In some ways, mitigation funds are like building codes. But not in every way, and that’s what is going to make this complicated. Emily Badger uncovered these maps by Brookings Institution researchers Alan Berube and Elizabeth Kneebone comparing poverty in 1980 to 2010. Poverty is no longer confined to the inner city. It was the evening of January 12, 2010, and Kathleen Tobin had just landed in Chicago’s O’Hare International Airport having come from Port-au-Prince, Haiti. Tobin is a historian at Purdue University Calumet in Hammond, Indiana, and she had been visiting Haiti for research. Shortly after getting off the plane, she heard that a massive 7.0 earthquake had struck only 16 miles west of Port-au-Prince, where she had been mere hours before. The earthquake had leveled large portions of the city. 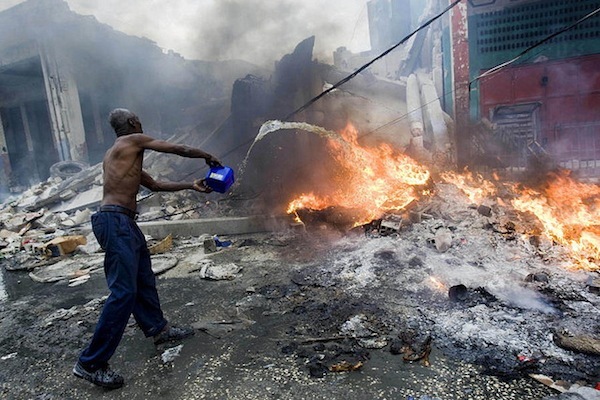 The Haitian government estimates 100,000 houses were destroyed and another 200,000 were damaged. Some were informal housing units—commonly known as slums—but some were also legal dwellings. Regardless of their legal status, most of the buildings that collapsed in the earthquake were poorly built using brick and concrete with little to no steel reinforcement, the sorts of structures that are death traps when the ground starts shaking. Tobin, shaken by the ordeal, set out to uncover historical trends and coincidences in Haiti that made the earthquake so lethal and destructive. Haiti has a long history of governmental ineptitude and corruption, both of which Tobin found contributed to the devastation. But she also discovered that the problems wrought by government failures were magnified by an exploding urban population. Haiti’s government and economy were intensely concentrated in Port-au-Prince. All of the country’s eggs were in one sagging, moth-eaten basket. One disaster there would send shockwaves throughout the country. Which, of course, it did. Haiti, like nearly every other country, has gone from mostly rural to largely urban in the past several decades. But in Haiti, the roots of that trend extend back to the early 1800s. Then, the new republic was centered on Port-au-Prince and Cap-Haïtien, the two major ports, as a result of the country’s export economy. The trend continued in the 20th century. The U.S occupied the country in 1915 after a large number of political assassinations and in the process discouraged peasant farming in favor of other economic pursuits that would ostensibly integrate Haiti into the world economy.¹ When the U.S. left in 1934, Port-au-Prince was filling up. Not long after, concerns grew about the state of housing in Port-au-Prince. The outlook wasn’t rosy when urban migration picked up in the 1960s. There weren’t enough jobs in the city for the number of people who lived there, but the situation in Port-au-Prince was still better than the countryside. People flocked to the capital at such a rate that by 1996 Haiti’s population was the most concentrated in the world. The dictatorships of the two Duvaliers—François from 1957 to 1971 and his son Jean-Claude from 1971 to 1986—did little to help. Corruption became ingrained and governance suffered. The countryside was largely forgotten, with the exception of taxation. Under the Duvaliers, nearly 80 percent of government revenues came from taxing peasant farmers. The wealthy, who mostly lived in the cities, were barely touched. Basic services foundered. There hadn’t been a census since the 1950s, and even that one may have been off by as much as 15 percent. Port-au-Prince hadn’t had an official urban plan since the 1930s. Building codes were few, weak, and generally not enforced. Land records were spotty, so people built whatever shelter they could wherever they could find space. When the earthquake struck in 2010, nearly 30 percent of the country’s population lived in the Port-au-Prince metro area. But even that large number fails to underscore just how deeply the nation relies on that one city. The nation’s government and economy are almost entirely dependent on the capital. It’s a cautionary tale for countries with keystone cities—England with London, Japan with Tokyo, South Korea with Seoul—and countries with vast slums and impoverished countrysides—much of sub-Saharan Africa, Bangladesh, Brazil. While many countries with vital capitals are better prepared than Haiti—it’s hard not to be, given that the country has consistently ranked at the bottom in terms of infrastructure—a plan for resiliency would be wise. Japan, for example, drew up plans for a backup capital after the Tohoku earthquake and tsunami. The proposed location is farther from the coast and higher in elevation. Haiti, of course, never had the luxury of considering a backup capital—it didn’t even have a functioning primary capital. It still doesn’t. More than three years after the earthquake, over 300,000 people still don’t have permanent homes.² But neither do they have anywhere to go. In Haiti, life is in Port-au-Prince, whether that life is comfortable or not. Note: Tobin has also written a book, Brush with Haiti, about her research and experiences there. Photo by the United Nations. You’ve also predicted that 25 years from now, 80 percent of the United States will be connected by rail. Twenty-five years isn’t that long from now. No, I know it’s not. And it’s a good plan. It’s the president’s plan. That’s the kind of vision that Eisenhower had about the interstates. And we’ve gone through a lot of presidents and a lot of Congresses and a lot of governors, and we built the interstates. I hope we continue to have people of vision that will carry out this idea that the country will be connected [by rail]. Walker will allow the Wisconsin Center for Investigative Journalism to remain on the UW-Madison campus. Lawmakers had added a provision to boot the center from Vilas Hall and bar university staff from collaborating with it. They declined to say which lawmaker was behind the idea, but said they believed the center had a left-leaning bias and they believed journalists should not rely on state subsidies. Critics called it an assault on journalistic independence and said it appeared to be payback for their stories, including one breaking the news about a physical altercation between two state Supreme Court justices. Walker said arrangements between the university and private groups should be addressed by the UW Board of Regents, not lawmakers in the state budget. If you read Per Square Mile via Google Reader, you probably already know Google is shutting the service down July 1. Not to worry—there are several viable replacements out there. But the first thing you should do is export your subscriptions list. Next, take a look at the spate of replacements (linked above). I haven’t chosen mine yet since I mainly used Google Reader to sync between my various RSS apps, which come Monday will be as communicative as an estranged family. Hopefully, things will sort themselves out in the coming months. But in the meantime, export and migrate so you don’t miss any articles from PSM or any of your other favorite feeds. Current US renewable energy policy encourages development where the best resources, wind or sunshine, exist to create the most power. But the authors of a new study argue that analyzing the benefits of renewable energy projects should include the environmental cost of the electricity being supplanted. Basically, if you install a solar array in the sunny Southern California desert, that power mostly replaces electricity made with relatively clean natural gas. In contrast, if you installed the same solar panels in considerably less sunny Ohio, you’d be primarily replacing capacity at a coal-burning power plant, reducing far more air pollutants than in California.